Erin Bond is an undercover cop who might have to arrest the man she's fallen in love with. Integrating into the skydiving scene, she's out to stop the supplier of drugs. When death follows the crew, she must work fast to save her witness. Brandon Anderson, a professional skydiver, is a psychic who has visions that come true. When he sees Erin shot in the back, and knows that he's going to die as well, he tries to talk Erin out of being with him, but she's hard to get rid of. 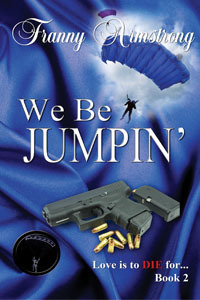 They must work together to save lives, but can they take down a drug lord, or will they die trying? "You’ve captured my soul, Ember," he said softly. She stayed silent, her shoulders tensing. Gently, he turned her to face him, and placed his finger beneath her chin to lift it so that her eyes met his. He searched for answers then smiled. The answer was there. She wanted him too. Slowly, he lowered his lips to brush gently across her trembling mouth. Shuddering, Ember stayed still. His hand rested on her shoulder, near her neck. Her heart beat like a hummingbirds wings as she held her breath. He knew she wanted this. A strong connection shivered between them, forged before they’d even met. Slowly sliding trembling hands up his chest until they circled behind his neck, Ember deepened the kiss, pulling his head down to meet hers. Phoenix's body filled with energy as their souls merged, he wondered if he would burst into pieces. Her lips were magnetic, pulling him close, holding his own captive in their embrace. Gasping, Ember slipped her hands into his thick ebony hair, pulling him even closer. His hands suddenly grasped her wrists, and he pulled away from her. Tears filled her eyes at his rejection, and she drew in a ragged breath. "Ember wait, I promised Brett I would protect you, and here I am—." He couldn't continue, shaking his head. "You don’t want me?" Her eyes glittered with tears. "You have no idea how much I want you, but I swore that I would take care of you, not take advantage. I can’t stand being in the same room as you and not touching you, kissing you, holding you close. But Brett—." Ember appeared to be surprised. "Are you saying that you do want me, but because of my brother, you won’t—." Seeking her forgiveness in her glittering blue eyes, he found what he searched for. "That’s pretty much it. I owe Brett a lot, and he deserves my loyalty." "To hell with Brett!" she cried. "I’m a grown woman, and I make my own decisions. Please…kiss me again!" Her eyes beseeched him, and he groaned, fighting a losing battle with his attraction to her. Taking things into her own hands, she reached up and slowly wrapped her index fingers around locks of his silky hair, and gently reeled his head in closer and closer until his lips touched hers. Then she took the initiative and began kissing him, gently at first, and then with voracious passion. Groaning, his arms encircled her waist and he gave in, unable to resist her offer.